The chiefs and people of Tontokrom in the Amansie West District have received high marks for the strong support for the anti-galamsey fight (illegal gold mining). Colonel Michael Amoah-Ayisi, Commander of Operation Vanguard (the joint military-police taskforce set up to check illegal mining), applauded the determined effort the community was making to flush out illegal miners from the place to protect the Offin River. He said what they were doing was a good example for people in the other mining communities, adding that, it was in everybody's interest to safeguard the environment. This was contained in a press statement signed by Squadron Leader Robison Omane-Agyei, the Public Relations Officer (PRO) of the Taskforce. The Commander called for increased public cooperation by way of the supply of useful and credible information to track down and arrest those who had chosen to defy the ban on the illegal activity. The Taskforce on February 16, carried out operations along the Offin River together with a special team from the 64 Infantry Battalion, Army Engineers, Ghana Navy and the National Small Scale Miners Taskforce. 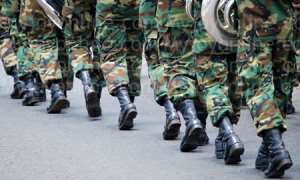 It targeted Abora, Trposo, Akwaboso, Subin-Nkoranza and some other communities in the Upper Denkyira West and nabbed eight suspected illegal miners. Additionally, 144 chang-fa (floating platforms) were immobilized. Since the start of its operation on August 01, last year, the Taskforce has arrested 1,040 miners, 135 had been convicted, seized 401 excavators, 60 vehicles and 57 motorbikes. It had also destroyed 4,000 chang-fa and 1,107 water pumping machines, and captured 87 small arms and 1,382 cartridges ammunition.